Chicken manure is the best of organic fertilizers that you could apply to get results from demanding crops, fruit bushes and trees, and lawns. Gardeners have recommended its widespread use among flower beds too. Indeed poultry/chicken manure contains everything that your plants need. Heat treated and dried - it's easy to use straight from bags or tubs. But its proportionally higher nitrogen content makes it especially suitable for leafy crops like cabbage, salad crops, courgette, sweet corn, rhubarb, and celery as well as on spring lawns. I use it on all gross feeding plants including potatoes - see below. I find it relatively clean and easy to use in dried form - always wash hands after gardening. Heat treatment (e.g. to over 250oC for 6X), ensures it contains no disease or viable weed seeds. So it's easy to handle and spread from bags or tubs as pellets, or on lawns by using a loose dried form of poultry manure spread from bags with a wire rake. Take care not to overuse. You'd hardly notice the faint odor from dried chicken manure. But it's enough for you to know that some nitrogen is released immediately as ammonia. This is very soluble, so damp soil gets a small rush of nitrogen from the outset. Ensure the soil is sufficiently damp or watered when you apply it. 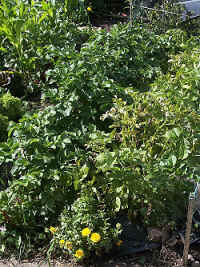 As my plants don't grow much in the cold season, a slow nutrient release at that time isn't a problem. There's no benefit in waste. see making liquid manure below. However, there's good reason to apply the fertilizer as early as possible in late winter and under soil warming fleece. When the ground warms a little soil bacteria release the plant nutrients over time. Use These Quantities For Base Fertilizer. 300 grams (~10 handfuls of pellets) (9oz/sqYd) before planting shrubs, hedges and trees. After 4 to 6 weeks a second application as top dressing at 100 grams per square metre, lightly hoed in and watered on, is best to maintain green vegetables growing over a longer term. And now here are Horse Manure Pellets from the traditional source of manure. Poultry and cow manure... are usually available on this link. Add to this organic matter and you have a superb soil conditioner capable of opening up clay soils. Only 150grams per square metre is needed for clays. Of course the organic matter helps to feed and bind light sandy soils too but in this situation I prefer to use bulk organic matter as well, e.g. garden compost. Note: Acid loving plants - ericas, rhodendrons, azaleas, camelia etc... as well as blueberries - all enjoy a low ph acid soil. Most fruit I grow prefer acid soils as do potatoes. You can expect chicken manure to raise the ph - perhaps making soil more alkaline for a short time - but quickly returning to its normal ph. So to some extent using manure with these plants depends on your pre-existing soil ph. Don't worry about chemistry. Manure is a major food source for growing big crops like potatoes. Fresh poultry manure is messy and needs careful handling - always wash afterwards. Never put it straight onto your garden. Put fresh poultry/chicken manure onto your compost heap in small layers or mixed in with browns such as hedge prunings or brown leaves. The over rich elements will be absorbed and stabilised, feeding your heap and making great garden compost that may be more alkaline than usual. Get all the benefits of chicken manure from already composted - heat sterilised - dried chicken manure. Available as dried flakes, compressed pellets, or 6X which is a more concentrated form. Here's a way to feed your plants when the soil is not warm enough to release sufficient nutrients from dried manure - but I think this is rare. Calculate the area to be treated and the amount of manure that you would normally use. Put this amount into a sack and soak in water. Pellets will take time to dissolve. It is important that you don't apply the total dose all at once. Pour about one third of the liquid manure into a watering can to dilute it before watering onto soil around plants. Repeat after 2 weeks and 4 weeks using plenty of water. Liquid manure can be used to boost gross feeding plants when your soil is running short on supply. But do remember to add more nutrient rich garden compost.